Vivian is the adorable 2 year old daughter of Grant and Sandie Brady. Vivian was diagnosed with leukemia in early May of 2016 at the age of 15 months. Within 2 days of going to the doctor with a high fever and bruised gums, she was starting aggressive chemo therapy. Their lives were turned upside down in a flash. About 3 weeks into chemo, Vivian had a complication from the chemo and steroids. She experienced a bowel perforation. She was rushed into emergency surgery. They removed part of her bowel, along with her gall bladder because it was so infected from the bowel leaking into her abdomen. They had hoped to do the surgery through laparoscopy, but ended up opening her up because the infection was so bad. The surgeon later told Sandie & Grant that septic shock was imminent and they had caught the leakage just in time. Vivian came through all of it like a champ. Through all of it, Vivian has remained the sweetest and gentlest little girl. It is very common for Sandie and Grant to get upset when they see Vivian cry during her treatments. Vivian always gently caresses Sandie's cheek to comfort her. Vivian is the one having the treatment, but at 2 years old, she is more concerned with comforting her Mom and Dad through all of it. She really is a special little angel. Sandie is a 6th grade middle school teacher at Geneva Middle School South in Geneva, IL, She has dedicated her life to her students. I can’t tell you how many times one of her former students has told me that she was their favorite teacher. Since this all happened in May, she was at the end of her school year which was a blessing since she was approaching her summer break. As summer went on and Vivian’s treatments continued, the thought of trying to manage work and everything going on with Vivian was too much to bear. Vivian needed and only wanted her Mom or Dad at that point because she was feeling so sick off of the time. As a teacher, her job is protected if she takes a year off, so that’s what she decided to do. As a 2 income household, this was a major hit to their finances. Sandie carried the insurance for their family, so they have to pay for Cobra insurance now. Grant is a restaurant manager who was forced to take unpaid leave to be with Sandie & Viv when all of this happened. They needed him with them. He returned to work in July 2016, once Viv was recovered from her surgery and was getting used to her treatments. They are not fancy people as it is and already lived a very modest lifestyle. The money donated would help to pay their monthly insurance and other expenses until Sandie returns to work. They have had a really hard time accepting help from friends and family. They were always the ones offering help, so receiving it was difficult for them. We told them that now is the time to accept help. They have vowed to pay it all back through supporting other families in similar situations, once they get Viv better. They already organized a toy drive for the kids at Lutheran General in the Pediatric unit of the hospital for all the kids spending the holidays in the hospital. It was huge success and they loved putting a smile on the kids’ faces. 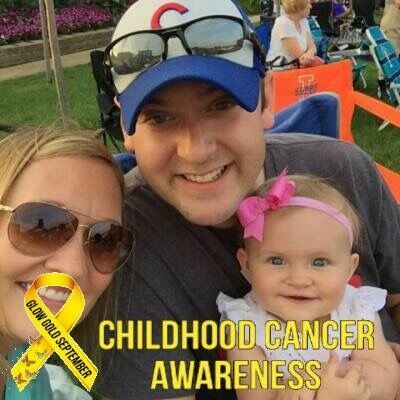 I have no doubt they will get even more involved and be advocates for childhood cancer for years to come. Join us to show your love and support for this brave, courageous little girl and her wonderful family!